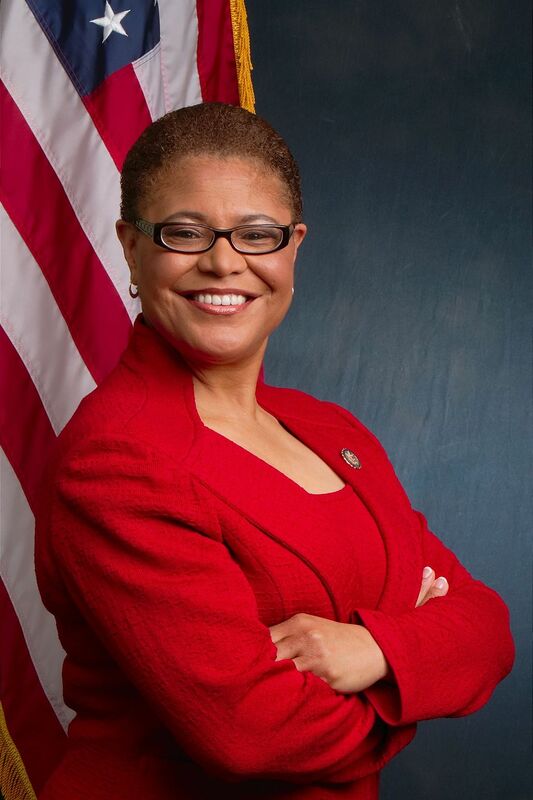 On November 28, 2018, Congressmember Karen Bass was elected to serve as the 26th Chair of the Congressional Black Caucus (CBC). As chair, she is leading the CBC’s historic 55 members during the 116th Congress. Chairwoman Bass is currently serving in her fifth term representing California’s 37th Congressional District. She serves on the House Committee on Foreign Affairs, where she Chairs the Subcommittee on Africa, Global Health, Global Human Rights and International Organizations, as well as the House Judiciary Committee, where she is active in working to craft sound criminal justice reform policies. Prior to her election to Congress, Chairwoman Bass served in the California State Assembly, where in 2008, she made history by becoming the first-ever African-American woman in U.S. history to serve as Speaker of any state legislature. During her tenure as Speaker, California endured its greatest economic crisis since the Great Depression. Under her leadership, the State Assembly came together to address the financial emergency with legislation to help Californians affected by the economic crisis. For her action, she was one of four legislative leaders awarded the John F. Kennedy Profile in Courage Award in 2010. While working as a Physician Assistant and as a clinical instructor at the USC Keck School of Medicine Physician Assistant Program, Chairwoman Bass witnessed the devastating impacts of substance abuse in Los Angeles. In the early 1990s, she convened a small group of community organizers, both African-American and Latino, and founded Community Coalition, known locally as CoCo. CoCo's mission is to help transform the social and economic conditions in South Los Angeles that foster addiction, crime, violence and poverty by building a community institution that involves thousands in creating, influencing and changing public policy. CoCo has become a nationally known community institution that has successfully changed many areas of public policy and trained a new generation of leaders. Upon arriving in Congress, Chairwoman Bass founded the bipartisan Congressional Caucus on Foster Youth. The caucus has a membership of more than 150 Members of Congress who are dedicated to improving the child welfare system and has successfully promoted passage of many key policies aimed at improving the nation’s foster care system. Chairwoman Bass has also acted to build coalitions and support economic growth and partnerships with the African continent, with a goal to transform how the United States engages with African nations and to promote the many opportunities to expand trade and economic growth between America and African nations. During her time serving as Ranking Member of the Subcommittee on Africa, Chairwoman Bass played a key role in the reauthorization and strengthening of the Africa Growth and Opportunity Act (AGOA), which enables the nations of Africa to export goods to the United States duty-free. For the past six years, Chairwoman Bass has served as chair of the committee on caucus procedures that sets the rules for the Democratic Caucus. Chairwoman Bass grew up in the Venice/Fairfax area of Los Angeles, which is the same area she represents today in Congress. She is a graduate of Cal State Dominguez Hills, the University of Southern California’s School of Medicine Physician Assistant Program, and the USC Masters Program in Social Work.